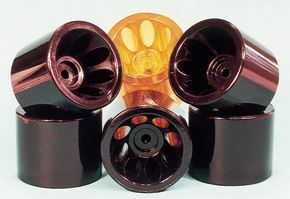 Custom-molded urethane wheels are designed to replace the plastic ones on a popular industrial vacuum cleaner. Plastic wheels quickly deteriorated in the harsh environment of chemicals, gas and oil on floors where the vacuum cleaner is regularly utilized. Whether you are designing a new industrial cleaning device or need to replace parts for an existing unit, American Urethane, Inc. is the company you can trust to deliver a quality custom-molded urethane part, on time, and at a reasonable price.